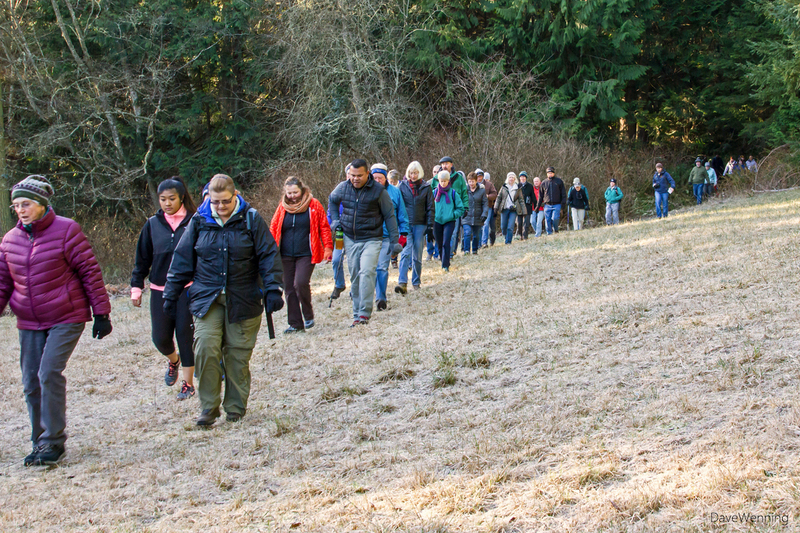 On New Year's Day I attended the fourth annual First Day Hike at Deception Pass State Park. This has become an annual event in state parks around the U.S. 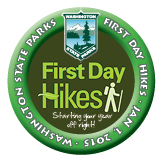 In Washington State, I counted 28 First Day Hikes on the State Park calendar. This year's hike at Deception Pass took us to Ginnett Hill, one of my favorite places in the park. 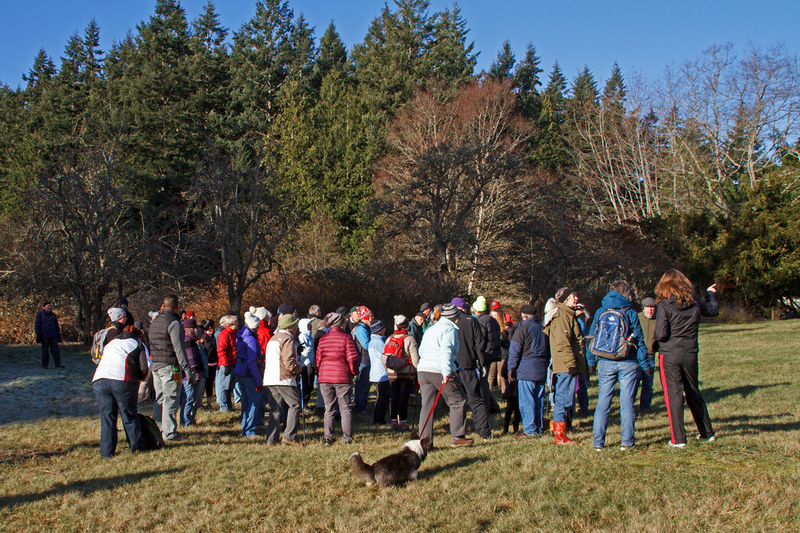 We assembled at the trail head in the Pass Lake parking lot at 10:00 a.m. Our hosts were Jack Hartt, Park Manager and Carly Rhodes, Park Interpretive Intern. Our group was at least 60 to 70 strong. Again this year, the hike had two legs. The first took us about a mile to the meadow on the north shore of Pass Lake. Then we doubled backed part way to the Ginnett Hill Trail for the second leg. This trail took us another mile through a rain forest and up to the old homestead site at the top of Ginnett. The weather was chilly but perfect for the hike. At the start, the temperature was below freezing with a clear, blue sky. Pass Lake was shining in the winter sun. Skims of ice had formed in spots at the edges. The trails had been beautifully groomed by the volunteers of SWITMO. They even provided bridges over the seasonal wadis that cross the trail. Several rain-free days before the hike also helped to dry them out. When we entered the meadow, we found a heavy frost covering the grass in the shady places. Out in the sunshine, it looked like summer in the meadow. The season was revealed only by the winter warmies everyone was wearing. 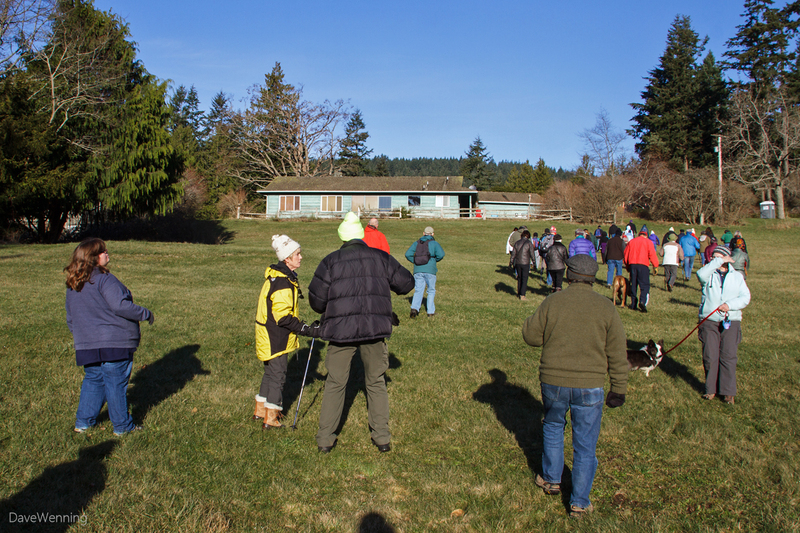 Here in the Olympic Rain Shadow, New Year's Day has given us great weather for all four Deception Pass hikes. 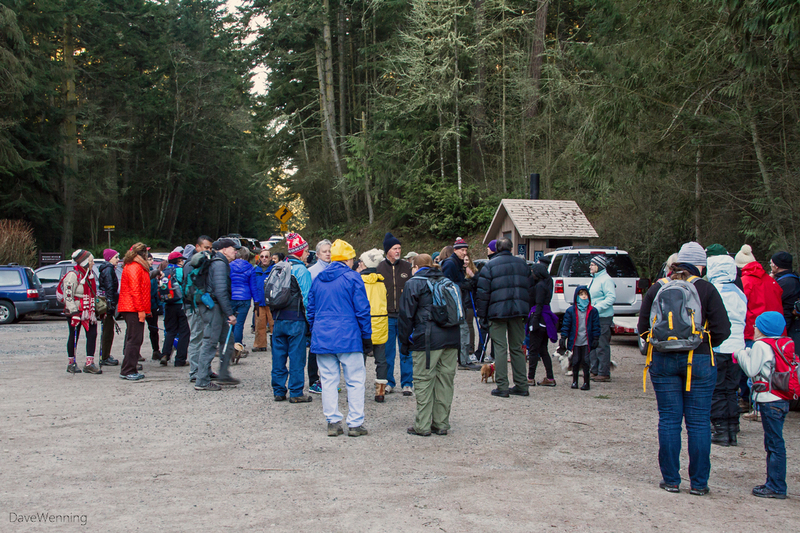 Before heading back for the second leg, we were invited up for coffee, cocoa, a drink of water and really good muffins provided by the Deception Pass Park Foundation. We got a nifty souvenir button, shown at the top of this post, also courtesy of the Foundation. At the top of Ginnett, visitors can gaze into the valley from the edge of the cliff. 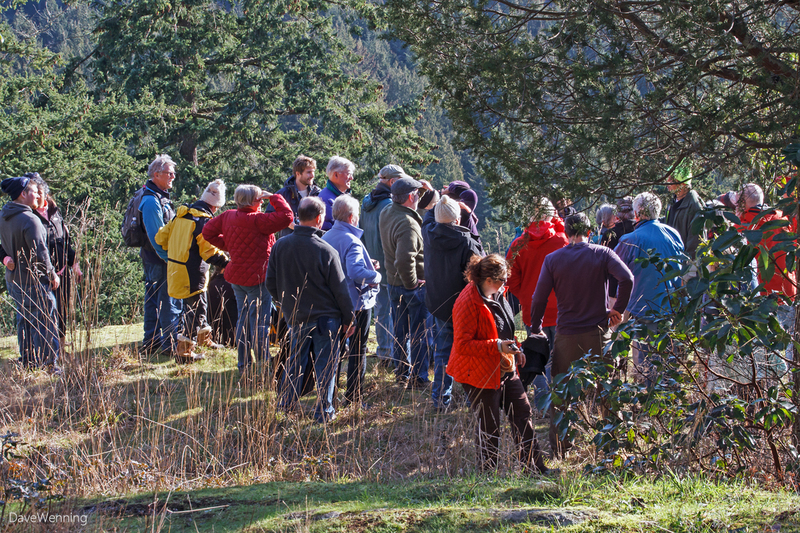 Jack Hartt, in the bright yellow hat, points out the sights and relates the history of this section of the park. 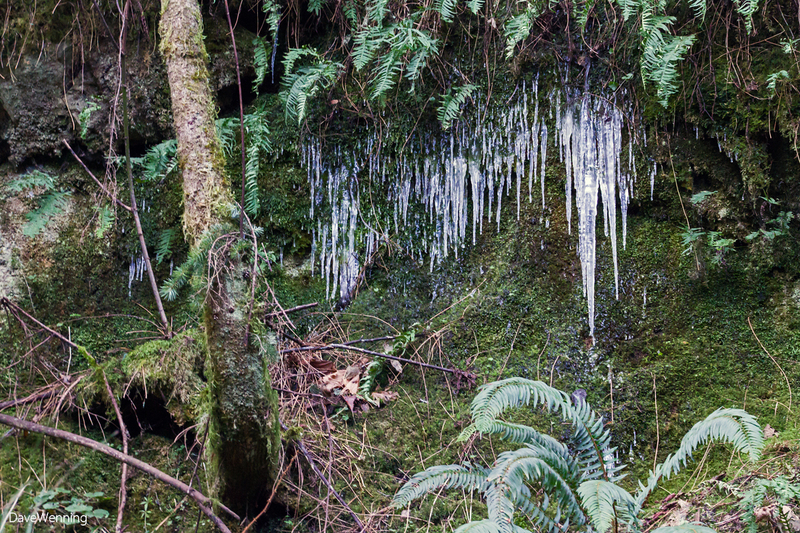 Winter wouldn't be complete without a few icicles. Here are some clinging to the stone cliff next to the trail in the depths of Naked Man Valley. Getting outdoors on a winter day is a wonderful way to start the New Year. 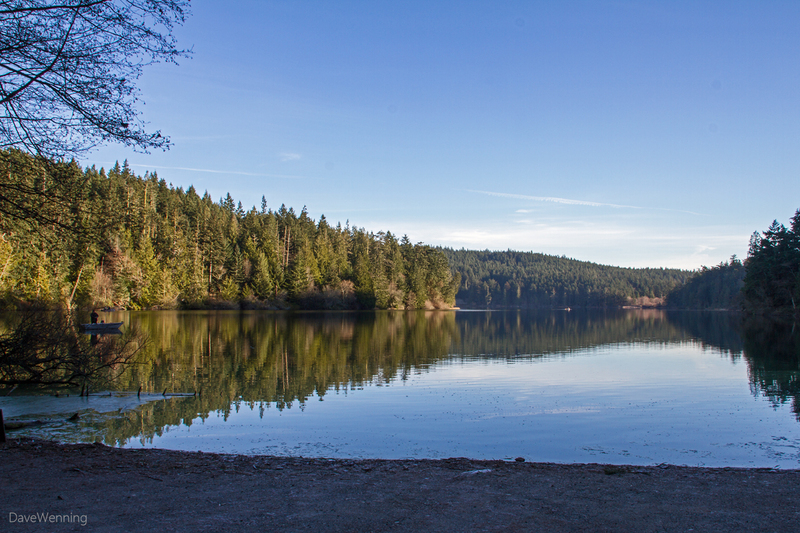 With each First Day Hike at Deception Pass, we have explored a different section of the park. With around 30 more miles of trails to go, I am already looking forward to next year.